In this course I teach how to time events with the Birth Card system. Prerequisites: Time and the Little Book course is required in order to understand this course. 364 Day and Year Cards; Year Card in Relationship to the Year Spread; Year Card in Relationship to the Day Spread; Day Card in Relationship to the Year Spread; Day Card in Relationship to the Day Spread; Day Card in Relationship to the Life Spread. 7 Year, 7 Day and Other Progression Spreads; Day and Year Card in Relationship to the Progression Spreads; Progression Spread Example. Marriage Separation and New Love at 45; Predicting Elections – the 1992 US Presidential Election; Predicting Wealth- Bill Gates; Predicting Children; Predicting Miscarriages and Abortions; Ups and Downs in Relationships. 26. The 52 Birth Cards – Putting it All Together. In respect to the information in this video I am currently working on one involved video for each of the birth cards. Videos on each card will be added to the above link as I get them done. 31. The Life & Times of the 52 Birth Cards. Astrologers use 12 Bhavas or houses that indicate specific things in the horoscope. 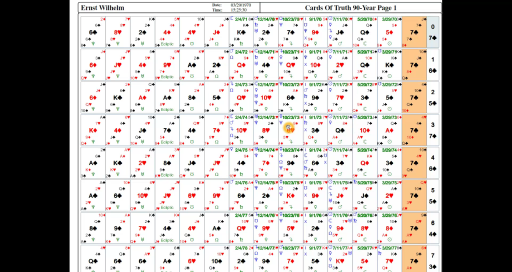 We are already using two of them, the Ascendant and the Midheaven Cusp which are indicated by the I and X in the Card Spreads as shown by the Cards of Truth Software. 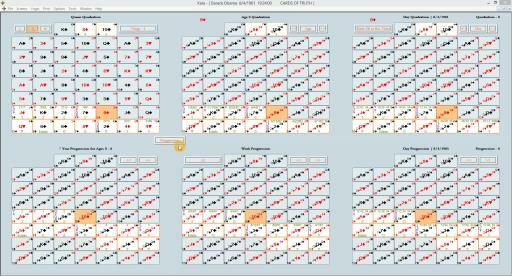 The other 10 Bhavas are indicated by numbers 2-9, 11 and 12 in the Card spreads as shown in the Cards of Truth Software. Western astrologers call these houses due to the idea that these points are boundaries in the horoscope, but that is not exactly correct, so it’s a poor name for these points. The reason for why these twelve sensitive points in the horoscope have become boundaries of houses in western astrology is due to a long history of astrologers intermixing astrological principles without fully understanding the principles place in the larger scheme of the science. The boundaries are correctly the signs of the zodiac themselves just as we use them in the cards system with a full sign falling under the sway of a particular card in the card spread and any planets in that sign also falling under the sway of that same card. Degree based Significators; A Family Tragedy; The 2008 US Presidential Election. Focusing Events & Timing with the Ecliptic Card. Reading Spreads: The Self; Finding the Path of the Self; Disruptions to Self. Resources & Resourcefulness; Resources Examples. 44. Siblings, Associates & Coworkers. I will continue to add examples of reading more types of things with the birth card spreads. I will not be adding any more techniques to this course, just more examples of using the same principles to read different things. You can never see to many examples, so I plan on continue putting more examples here over a long period of time, so come back to this section regularly and see what’s new.